Solar energy, an alternative and renewable power source, has been proposed by many as a great source of energy. Although it is not widely used today, solar energy has a great potential to be used in future. There are several ways to harness the sunlight. The use of solar panels or photovoltaic cell is the most common way to acquire the much needed solar energy. They are very efficient in generating a clean and renewable source of electricity. Solar panels gather and directly convert the sun’s energy into electricity. During daylight, the photovoltaic cells which are arranged on a grid like pattern on the solar panel’s surface collect the sunlight and turn it into electricity, the charger controller regulates the amount of energy sent to the batteries to avoid being overcharged or with low energy, batteries store the energy to be used at night or when there is a blackout, the inverter is needed to convert the DC (direct current) to AC (alternating current) which is used in your home appliances. Another way to harness the sunlight is by using solar thermal energy. This is commonly used for heating homes, providing hot water, heating swimming pools, and space heating. Usually, space and hot water heaters use a storage tank to store the heated water while pool heaters recycle the water by using collectors which heat the water and return it to the pool. The other way to harness solar energy is through passive solar. A good example is opening your windows or curtains in the morning to let the sunlight in. Passive solar also known as direct gain includes the building architecture that has a good thermal mass such as specific kinds of materials that can store the sun’s energy for future use. Basically the solar energy advantages are numerous, is something to think about so that you can save cash and also the environment. Although solar energy has its disadvantages, these will surely be covered by its advantages as further researches are done to bring the use of solar energy into a higher level. Here are some solar energy advantages. • Solar energy is a renewable energy source. Though we cannot harness it during night time, we can still rely on its availability day after day. • Solar energy costs nothing. The energy from the sun is free so after giving up a little bit of money, the source of energy is practically free. • Solar cells do not require much maintenance once these are brought up to their maximum efficiency. • Solar cells are quiet collectors. They produce no noise unlike any other energy sources. • Solar panels are very reliable. With parts fixed and not moving, these can last longer than any other energy source. 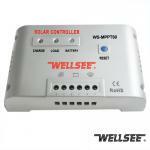 Charge controller is important in one solar system, then how does it work? As we now know, solar energy can be harnessed to feed batteries. This happens through the use of solar panels which collect and harness the energy, converting it into electricity. But solar power is a little more complex than just a solar panel and a battery. What happens when the battery is full? And how do you know that a solar power system is working optimally based on actual power use? That’s where a charge controller comes into play. Photovoltaic cells collect the sun’s energy from the solar panel’s surface and the charge controller regulates the amount of energy sent to the batteries. From there, an inverter is used to convert the direct current (DC) to an alternating current (AC) necessary for running home appliances. Once all the components are installed and running at full capacity, solar electricity is used quietly, efficiently, with zero pollution output and at no cost to the environment or the household. 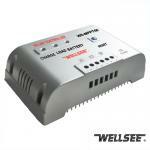 The charge controller is one of the essential elements in harnessing solar energy. The solar panels pump current through the battery (or bank of batteries) in one direction. At night, the current may also reverse direction, which wastes energy. Some charge controllers have mechanisms to prevent this wasteful reverse current. Instead of passing through a semiconductor, some charge controllers use electromagnetic coils. The current sent through the electromagnetic coil passes through a relay which switches off at night, preventing any reverse current. Photovoltaic cells work to charge a battery, but you do not want the battery to overcharge. If current continues to be applied to a battery that already has full voltage, it can cause a series of negative conditions for the equipment as well as the current itself. To prevent overcharge, charge controllers reduce and regulate the flow of energy to the battery. The regulation of the amount of charge being delivered to a battery is the most important function of the charge controller. Whether the charge controller uses an on/off switch to regulate or if it is using the more graduated pulse width modulation, the method for regulating voltage is the key. Set points are set on the charge controller to determine the charge rate of voltages. Set points are determined according to anticipated use and type of battery.